I finally got to work on my Madrona Road Challenge... I'm not sure why I had such a hard time with this. I liked the fabrics well enough individually but they just didn't work together for me. It was also tough being constrained by the small amount of each print we received. If I'd started sooner I could have bought more but with the deadline looming and a blizzard raging I had to work with what I had. It's a little wonkier than I intended but I can live with it. I got it basted, started quilting, then yes, ran out of thread. Seriously, it's a gift:-) Luckily we're dug out here and I was able to make it over to Quilter's Way to restock. School is closed here again today so I'm hoping I can finish this up! 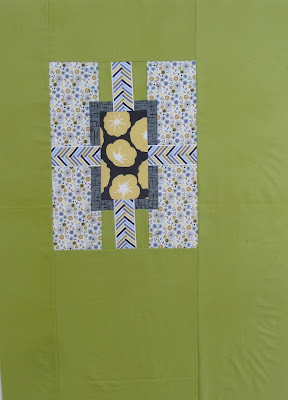 In the meantime I was able to do some FMQ on my Victory Garden quilt. Cute challenge mini! love it! You really do have a gift for running out of thread at just the right moment. I love the green with the challenge fabrics. Your Madrona Road quilt is looking great.Love the quilting. The heart paisley FMQs are beautiful! Oh, those polka dots are lovely. What is the fabric line? Ooh, love the Madrona Road project, especially that directional moment with the herringbone fabric and quilting! You did a great job with the challenge, I felt the same about the fabric. What is the green you used? I like how the Madrona Rd came out, the green really lightened those fabrics up! 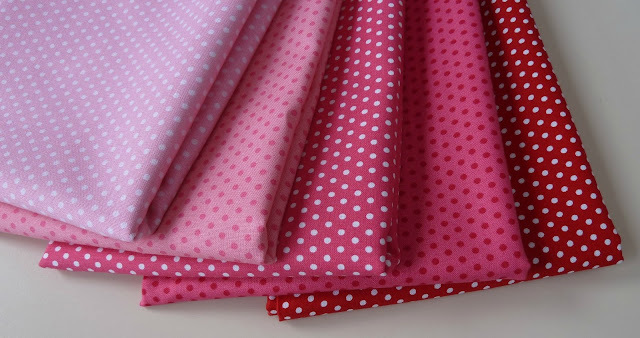 Also loving the polka dots - can't wait to see where those went!